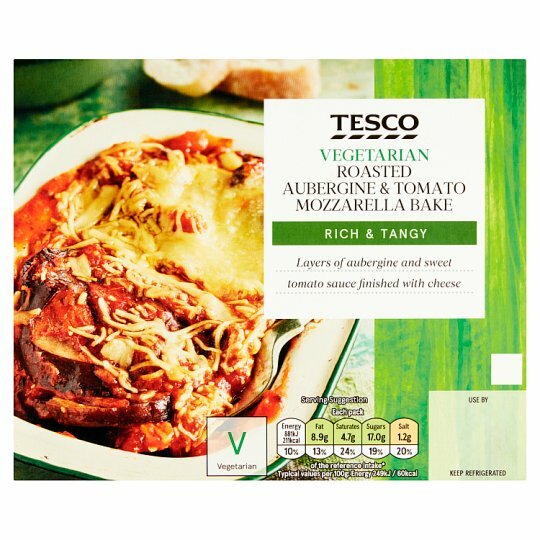 Roasted aubergine layered with tomato and onion sauce, topped with mozzarella and Cheddar cheeses. Aubergine (42%), Tomato, Onion, Mozzarella Full Fat Soft Cheese (Milk) (3%), Mature Cheddar Cheese (Milk), Cornflour, Garlic Purée, Rapeseed Oil, White Wine Vinegar, Salt, Gelling Agent (Pectin), Oregano, Thyme, Ground Black Pepper. Instructions: For best results oven heat. 190°C/Fan 170°C/Gas 5 20-25 mins Remove film lid. Place on a baking tray in the centre of a pre-heated oven. Leave to stand for 5 minutes after heating.